CIM Group tapped HDF.LA to rebrand and reposition Hollywood & Highland Center, a struggling $360 million retail & entertainment center, after purchasing it from it’s original developers. 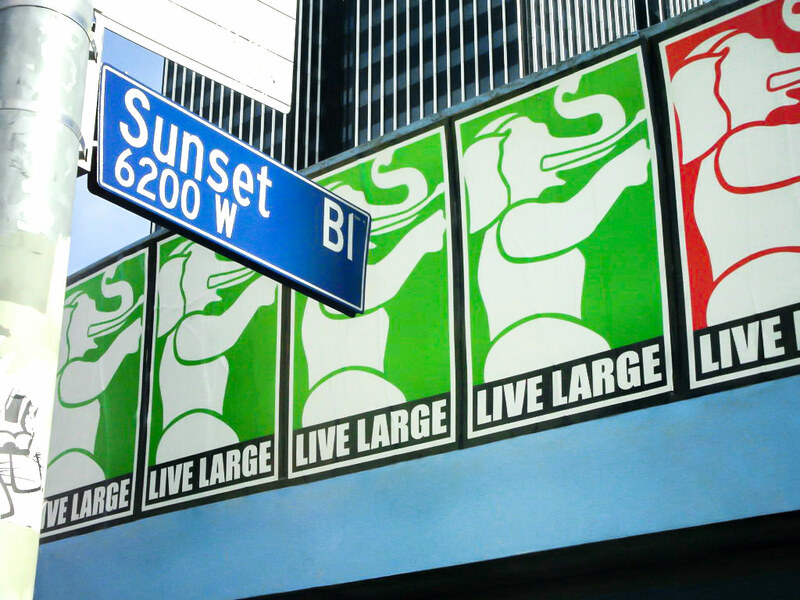 Along with the rebrand, HDF.LA developed the "Live Large" campaign, which was built around a strategy to embrace the center’s existing, enormous, and iconic Elephants, (reimagined from legendary D.W. Griffith’s film set Intolerance), as the graphic mascot in a campaign that utilized both traditional, digital, and guerrilla marketing tactics. The campaign needed to appeal to potential retailers, in-the-know locals (a formerly elusive audience), and tourists alike. The Elephants, which are a part of the mall’s Babylon Courtyard, are a direct reference to D.W. Griffith’s 1916 film Intolerance, and a monument to Hollywood’s legacy. HDF.LA used the Elephants in a modern and ironic manner, transformed through their color palette and graphic depiction. CIM’s original plan was to spend millions of dollars to remove them – HDF.LA recommended embracing them. The teaser for the campaign rolled out in three phases: the first to generate interest through guerrilla and OOH postings of the new elephant icon, The second added the "Live Large" call-to-action to the elephant icon, and the third included the new tag line "Shopping. Dining. Nightlife. Elephants.". This teaser approach garnered excitement and intrigue for the new energy coming to the Center. Results: Becoming "Times Square West"
H&H transitioned from a seasonal tourist attraction to a year-round entertainment and shopping destination that resonates with local consumers as well as national and international visitors. Prior to the campaign, the center was less than 70% leased and the merchant assortment was low–end to moderate stores. Following the "Live Large" campaign launch, the center was able to attract more desirable merchants including Louis Vuitton, Coach, Guess, BCBG MAX AZRIA, Hard Rock Cafe, Rolling Stone LA restaurant, and more. In the three years following the launch of the new branding image, the center was 100% leased and sales per square foot more than doubled, while H&H Center’s strategic alliance revenue (sponsorship and brand activations) increased by 134%. To brand marketers, the center became "Times Square West". HDF.LA curated a group of six influential LA street artists to collaborate on a series of limited edition and signed "Live Large" prints. 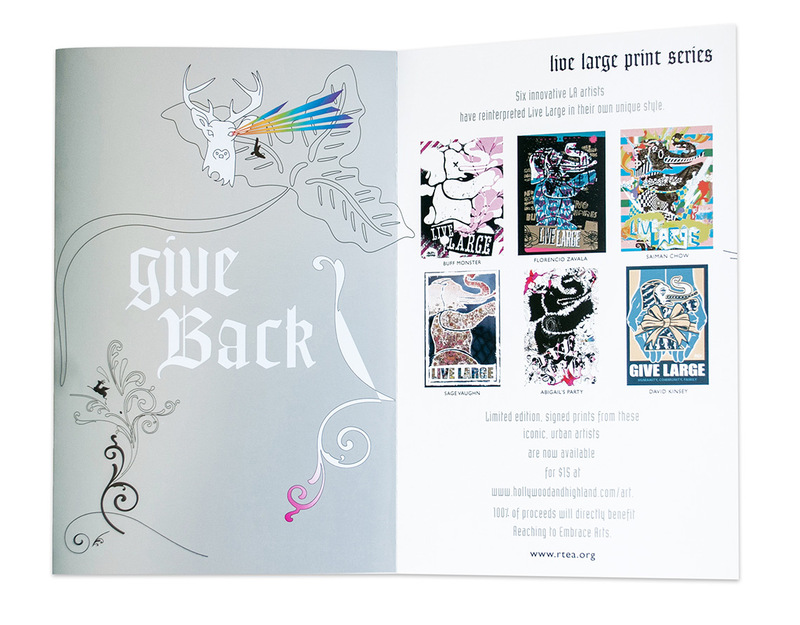 They were featured content of the brand campaign and part of an on-site installation to raise awareness and cool factor for the H&H brand, with all proceeds directly benefiting Reaching To Embrace Arts (RTEA), supporting art in public schools. Artists included: Alex Defer (DEFER1), Buff Monster, David Kinsey, Gregory Siff, Philip Lumbang, and Saiman Chow. HDF.LA engaged LA native, influencer, and international night life photographer, The Cobra Snake, to document Hollywood street life in and around Hollywood & Highland, establishing Hollywood Boulevard as a destination and epicenter of cool. The Cobra Snake shared these images on his channels and H&H leveraged them in their communication across digital, social, and traditional advertising. The Cobra Snake set up a "Cobra Shop" in residence at Hollywood & Highland, bringing an authenticity and credibility to the complex. 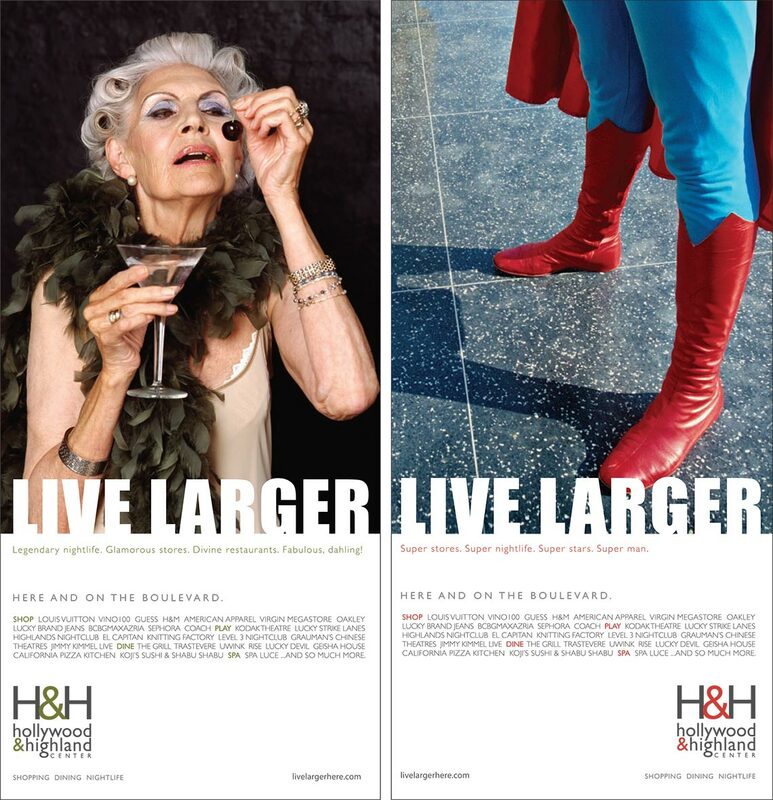 Campaign Evolution – "Live Larger"
"Live Larger" was an evolution of the original concept that embraced the shift in Hollywood becoming a hip destination, but not forgetting the irreverent, and outlandish style and energy that’s at the heart of this part of LA. The campaign was rolled out to H&H’s printed material, local billboards, 944 Magazine, the LA Times, and LA Weekly print ads. 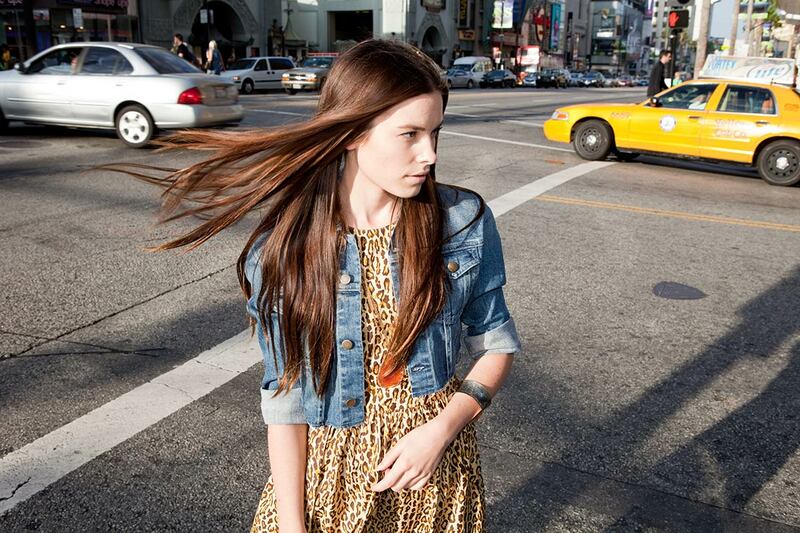 For this digital and social mini-campaign, the newly launched Hollywood Style Scene blog partnered with HDF.LA and Hollywood & Highland to photograph the latest street fashion trends, seen in and around H&H, as a promotional push for the Center, and Hollywood Style Scene online community. Made in Los Angeles, © 2017. Yes, we really have a pool. Come for a swim!